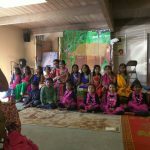 Categories: Gopa Kuteeram Kids Camp, Satsang. 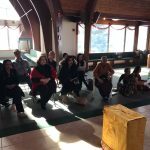 By the abundant grace of Sri Swamiji, Gopa Kuteeram Annual Celeberations “GURU SMARANA” 2014 was celebrated on February 1st 2014,Saturday at Shri Shirdi Sai Baba Mandir of North Carolina. 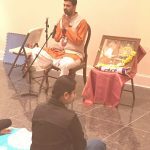 The event started at 6.15 PM with an introductory speech by one of Raleigh GOD members, Sri.Narasimhan Doraiswamy , about “G.O.D ” activities and Sri Swamiji. Kids program commenced with rendition of Mahamantra and Dhyana Slokas from Srimad Bhagavatam. 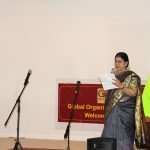 Mahima ,from Virginia GOD satsang performed a beautiful Bharathanatiyam dance for “Gambeera Srinivasa” ,which was composed by Sri Swamiji. Kids under 5years did a Kolattam dance performance for “Tharangam Tharangam”, and rendered the “Sadhus Sadhus” kirtan. 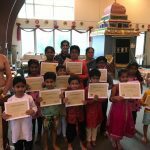 Kids of age group 6-9 yrs recited “Guru Ashtakam” . 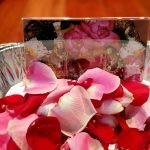 As a crown of all, kids enacted a play “Bhaktha Sabari”, showing how an ordinary, illiterate women was transformed into a great bhaktha ,only because of Guru Bhakthi. The devotees watched the whole event with awe and totally enjoyed all the performances by the kids. After Kids performance ,”MadhuraChitra” coloring contest results were announced by the judges Sri.Narasimhan Doraiswamy and Ms.Nabanita Das, a local renowned artist. MaduraChitra winners were honored by Trophy and Certificates. Gopakuteeram kids were also honored with Certificates and Gifts. 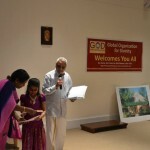 The event was ended up with Vote of Thanks by Sri.Rajasekharji. 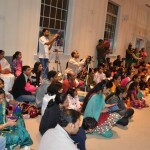 About 50 devotees took part in Gopakuteeram Annual Celebrations event.